Ask fellow campers about "Bar J Hitchin Post RV" and nearby attractions. Very spacious sites. Came for rattlesnake roundup so it was pretty full. Cable (13 channels)and wifi were good. Not the prettiest rv park but it worked for us. We camped at Bar J Hitchin Post RV in a Motorhome. If you want a quiet campground, this is not the place. The park is within a 1/4 mile of 2 major truck stops and I-20. Other than that, the staff is very helpful. The bathhouse and laundry areas are exceptionally clean. The office area has a pool table and large screen TV. The site was level with no shade. There are sites with shade. All utilities worked just fine. No table or fire ring. We camped at Bar J Hitchin Post RV in a Fifth Wheel. Home of the annual rattle snake round up. I will update my experience after visiting exhibit. This is the second time we have stayed at this park and will be back. It's small without a lot of amenities but very nice for an overnight or couple of days' stay. The sites are long, fairly level gravel with quite a bit of space between them and some large trees for shade. All utilities worked well, including cable and wi-fi. Staff is friendly and helpful and trash is picked up daily from your site. It is across the road from a large Love's truck stop and close to the interstate so there is some road noise plus a nearby train track but we didn't find it too loud with the windows closed and the A/C running. We camped at Bar J Hitchin Post RV in a Fifth Wheel. This was an overnight stop for us. This park is very nice. Landscaped very well, with lots of space between sites. Water pressure was very good. The park is located off of the interstate, but was very quiet. Office staff is very nice. We arrived after the office was closed, but site info was left out front for us. Will definitely stay here again. We camped at Bar J Hitchin Post RV in a Travel Trailer. This is a lovely campground - friendly people in the office and the park. Wifi was one of the best we've ever had and right off the freeway. We were only there overnight but had there been anything we wanted to see we would have stayed longer. 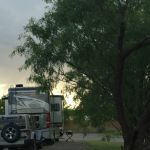 It's hard to find a good RV park in the are between here and Big Spring so very pleasant to find a very good one. 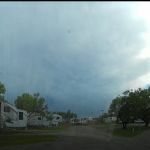 We camped at Bar J Hitchin Post RV in a Travel Trailer. Pleasant place for a one night stay. Only dumpster was fairly far from our site. No fenced dog park that I could find. The staff were extremely pleasant and flexible. Arriving after the office was closed was no problem. Fairly pleasant landscaping, but I suspect the sites get hot in the afternoon, since there is little true shade. We camped at Bar J Hitchin Post RV in a Motorhome. Nice, no frills park. Not a lot of overnight spots, so call ahead. Built on the side of a hill, but our pull through was level and wide. Good WiFi and limited cable. I had no problem setting up my portable sat dish. Good power (30amp) and easy sewer hookup. This place has mostly long term workers living there, but we had zero complaints. Was pretty quiet, could hear a little freeway traffic but wasn't bad at all. Will stay here again when passing through. We camped at Bar J Hitchin Post RV in a Motorhome. Have spent at least 4 different dates at this park. It is convenient coming out of Austin heading for the Panhandle. Made reservations for June 3, 2018, one pass through night as usual...by the time you get there you are tired and don't want any problems. Well we finally did - NO RESERVATION. Weekend person knew nothing - it's the weekly girls problem & fault. THEREFORE ZERO CUSTOMER SERVICE! The site we did get is like "PIKES PEAK". May be our last visit. We camped at Bar J Hitchin Post RV in a Motorhome. This is a no-frills park. It is located across the street from a large truck stop, which is very convenient after a long day's drive. Gravel roads, plenty of room for big rigs to maneuver. We arrived after hours and our information was posted on the board. We went to the site, leveled up, hooked up, no problem. There was a bit of highway noise, but with our A/C on, we did not really notice it after we settled in for the night. This is a good spot for an quick overnight stay when all you really want is a level site and a safe place to spend the night. We camped at Bar J Hitchin Post RV in a Motorhome. Check-in process was easy and very friendly. Called and made a reservation about 2 weeks in advance. They did not require a nights deposit to hold the site. Placed on site 47, a long pull through which was a level site with paving and some gravel. The main building looks like a barn on the outside but the inside is beautiful with cedar wood and furnishing suitable for a hitching post theme. The bathrooms are very clean with ceramic tile trimmed in cedar wood with spacious shower rooms with fold down seat in dressing area and door with lock. Free cable with standard channels. All stations clear but for some reason the ABC network did not have sound. Free WiFi provided. Strong signal and relatively fast service. Close to Interstate 20 and a Loves Truck Stop but site was quiet. Very nice park, spacious sites with grass and trees. Rate for one night was $36.00 with Good Sam discount + tax. Note that GPS will not get you to the Park. From I-20 take Exit 242 and go north on Hopkins Road. 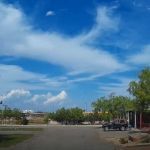 As you can see, I was impressed with this RV Park and hope I have an opportunity to pass through Sweetwater again in the future so that I can return to Bar J Hitching Post RV Park. We camped at Bar J Hitchin Post RV in a Fifth Wheel. Note that GPS will not get you to the Park. From I-20 take Exit 242 and go north on Hopkins Road. This is a decent park for an overnight stay. We had business in nearby Roscoe and all the other parks were rated very poor so we chose this one. There were a lot of permanent/semi-permanent residents but their sites were neat. The roads had apparently been paved at one time but are mostly broken up now although relatively smooth. The turns were fairly tight but we had no problem getting our 40' fifth-wheel around them. The sites were very level hard-packed gravel. The wi-fi was OK. Other utilities were conveniently located and everything worked well. There is no cable TV and we were only able to pull in 3 channels by the antenna; two kids cartoon channels and one home-shopping - definitely not anything we were interested in. It is close to I-20 and right across the road from the Love's Truckstop so there was some noise. Our biggest complaint was the areas between some of the sites were rough and hilly and were hard to walk on. We camped at Bar J Hitchin Post RV in a Fifth Wheel. A decent place for an overnight stop. Nothing fancy but I'd come back. The roads can be a bit tight in spots with a large RV eating rocks placed at the corners - but they are doable. The rocks might be pretty but I'd bet a few people left some paint on them. Campground is a tad noisy as its next to I20. Lots of workers - some let their dogs run loose while we walked ours around (leashed of course). Other than the loose dogs however, most of the workers kept their sites clean and were pleasant. Roads were a tad rutted and sites were Gravel/Asphalt/Chipseal... not quite sure what they were made of but decently firm for the jacks. I'd give the place a 7.5 if they would allow 1/2 points, but not an 8. Decent place for an overnight if you are traveling I20 in this part of Texas. Very nice entry/club house facility. We camped at Bar J Hitchin Post RV in a Motorhome. The park is about 500 yards from I-20 and across the street from the Love's Travel Stop. Traffic noise can be bothersome sometimes. There is a railroad track behind the park too. Not real busy and only hear the train horn once in a while. Site was fairly level and spacious. Gravel site and roads. Price seems a little high for having no amenities in the park like a pool or a dog run. Verizon phone and data reception were good. The park WiFi was kind of slow. Lots of long term tenants here. They were all real friendly. We camped at Bar J Hitchin Post RV in a Motorhome. The WASP museum is nearby and an interesting place to visit. This was a park we stayed at in early April 2018. The sites were spacious and the showers clean and well appointed. The staff was nice but when I had a package shipped to this address the lady who brought it to my rig questioned as to why I was having a package delivered when I didn't "live" there. There are long term campers here but all we encountered were nice. Also, Sweetwater was a nice town with good places to eat and stores for restocking essentials. The site was gravel and very spacious and mostly level. This is right across the street from a big truck stop so you'll hear the trucks coming and going but I did not find it that bothersome. All in all a pleasant few days, We camped at Bar J Hitchin Post RV in a Motorhome. Check out Bucks restaurant, good food, decent price. Small park but nice. Site was level and long enough for our camper and vehicle. Office employee was very friendly. Well lit at night to walk our dogs. We camped at Bar J Hitchin Post RV in a Fifth Wheel. They do take credit cards now. I didn't need it, but the Love's across the street is well supplied! We made reservations but there were two additional vacancies when we pulled in. Right accross from Loves truck stop for fuel and Arbys for fast food. Visit the National WASP Museum, honoring the Women Airforce Service Pilots in WWII. It's a truly amazing story and the only museum of its kind. Well worth a visit! Ate at Bucks Steak and BBQ one exit from park. Good chicken fried steak at reasonable price. Make sure they know you need a satellite view when you register. Convient to I-20 with a Love's service station across the road. We were tired so we didn't notice the sound of I-20 much. The roads in the park were partial gravel, reused asphalt and dirt. The damp grass cause havoc with our dogs dirty feet. The restrooms were a 10+. Really nice. The park was clean and plenty of space between sites. We would stay here again. The town of Sweetwater is hurting, but a convenient stop while travelling across Texas. Love's Travel Stop is just across the street. You won't see this RV park on Google Earth yet (as of this Oct 2016 post) because it's so new. But the directions are available in Google Maps. Prepare for wind in and around......all the time......those huge wind farms don't just appear for no reason! Some sewer connections were located at the rear of the site and some were located in the middle. Are you affiliated with Bar J Hitchin Post RV ?